On most Mondays, Stacy Masciangelo, a teacher in Mesa, Arizona, would be in her classroom teaching 33 junior high school students computer technology with outdated equipment that sometimes takes eight minutes just to log on. "We're frustrated. It's frustrating. How can you tell a kid education is so important when everything that our leaders do say otherwise?" Masciangelo told ABC News on Sunday. 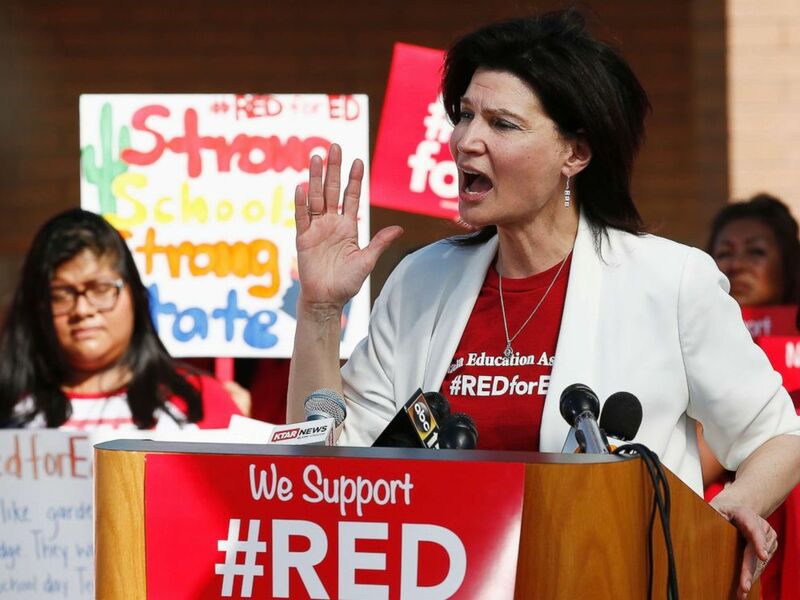 NEA President Lily Eskelsen Garcia speaks at the #RedForEd Walkout, March and Rally news conference regarding teacher pay and school funding Wednesday, April 25, 2018, in Phoenix. She has a bachelor's degree in business marketing and a master's in secondary education, but her take-home pay every two weeks comes to less than $900, and that's not including the money she takes out of her own pocket each year to buy classroom supplies. "But it's not about teachers being greedy. It's not about our salaries," she said of the strike. "Most teachers I know, they try to get by, they live paycheck to paycheck. My husband's a teacher. He has three jobs just to try to make ends meet. But we both have a calling. We're extremely passionate about it and we work ourselves to the bone trying to do it because it matters." Arizona, Oklahoma, West Virginia, Kentucky and Colorado have all seen teacher uprisings this year. All of the states, with the exception of Colorado, are dominated by Republicans in the governors' offices and legislatures. Three of the states -- West Virginia, Oklahoma and now Arizona -- have seen wildcat strikes by educators. 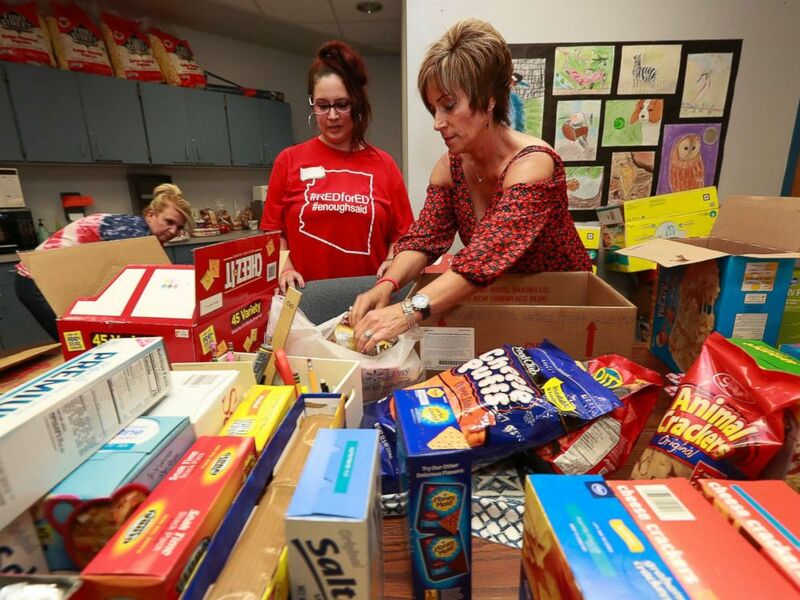 Highland Arts Elementary School teacher Amy Lahavich, right, organizes donated food for distribution to students and families on the eve of the teacher walk out, April 25, 2018, in Mesa, Ariz.
"It's happening in our reddest states. It's happening where for the last 10 to a dozen years there has been an ideology of cutting taxes on mostly big businesses and the expense, of course, comes at public services like a public school," Lily Eskelsen Garcia, president of the National Education Association, told ABC News today. "So the last time we had this horrible, horrible cut in school services was in the Great Recession 10 years ago, where we lost thousands and thousands of teachers and they laid off the school librarians and the band teachers and they said this is a crisis," Garcia said. "Well, nobody steps up more to help their kids in a crisis than a teacher. After a hurricane ... good lord, after a shooting." Garcia said there is a correlation between teachers taking to the streets to make their demands heard, and other protests that have recently swept the country, from the Women's March on Washington to massive student-led protests over school shootings. "This is not unpredictable. They understand the only power they have is to bring those voices together, to stand together and what they're saying is, 'We no longer have any faith in politicians. We have not seen that you have been doing your jobs, that you have been taking care of education, that you have been taking care of our safety, that you've been taking care of basic justice. And so we'll take matters into our own hands,'" Garcia said. "I would say that that's the straw that broke the camel's back," Masciangelo said of the West Virginia strike. "I've been pleasantly surprised," she said. "It's incredible the support we're getting from the community itself. "Whenever I have my #RedForEd shirt on and I'm out just doing daily stuff, I'm getting stopped constantly by people saying we support you," she added. 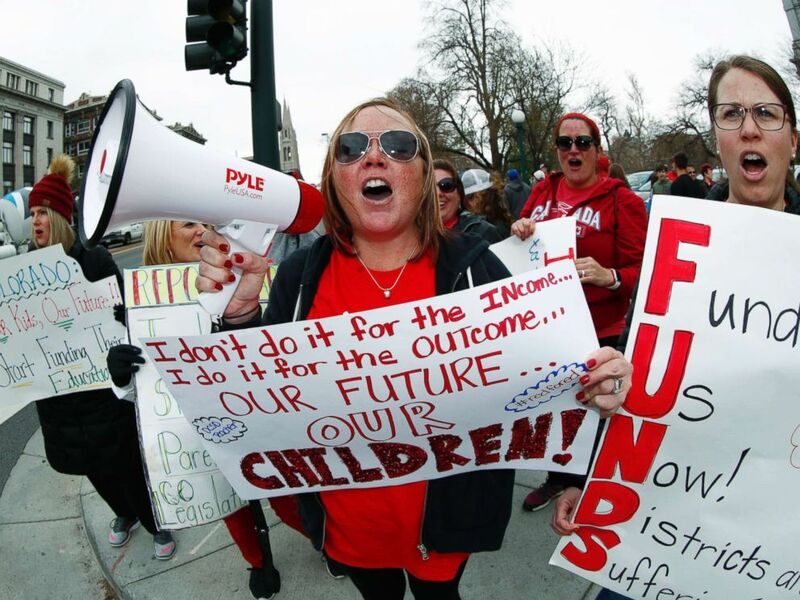 Nikee Onken, a teacher from Douglas County, Colo., uses a bullhorn to lead supporters during a teacher rally Thursday, April 26, 2018, in Denver. "Without a doubt, teachers are some of the biggest difference-makers in the lives of Arizona children," Arizona Gov. Doug Ducey said in a Twitter post last week. "They need to be respected, and rewarded, for the work they do -- and Arizona can do better on this front." 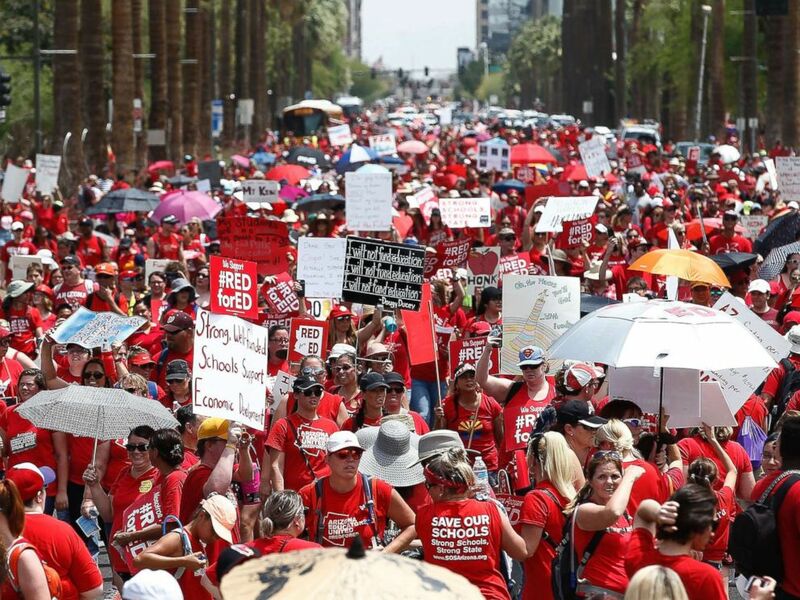 Thousands march to the Arizona Capitol for higher teacher pay and school funding on the first day of a state-wide teacher strike, April 26, 2018, in Phoenix. "We’ve all been listening -- but now, it's time to act," Ducey added. But teachers union officials aren't about to call off their strike just yet. "That's why we do know how to do our homework. We can see through all of these fake plans and unless there is a dedicated funding source, we are not going to be fooled," Garcia, the National Education Association president, told ABC News. "We want to see the plan and it has to be something that makes sense. This is not calculus. This is adding and subtracting."